I know what you were expecting. You were expecting a leadership lessons from Deadpool 2 article today. Well, you’re not getting it. After watching the first Deadpool movie, I realized it would be too crass and vulgar for a Reel Leadership. Instead, I’m using the Mother’s Day movie Breaking In for this week’s Reel Leadership article. Breaking In stars Gabrielle Union as Shaun Russell. Shaun had inherited her father’s house after he was brutally run over by a crazy driver. The young mother and her two children head to the recently inherited house. They discover the house is a fortress. Her father or grandfather had installed a high-tech security system. While the home was a high-tech fortress, a band of criminals had planned to break into the home. And they did. In the process, the criminals took Shaun’s son Glover (Seth Carr) and daughter Jasmine (Ajiona Alexus) captive. This turns the mild-mannered mother into a desperate mother attempting to save her children. 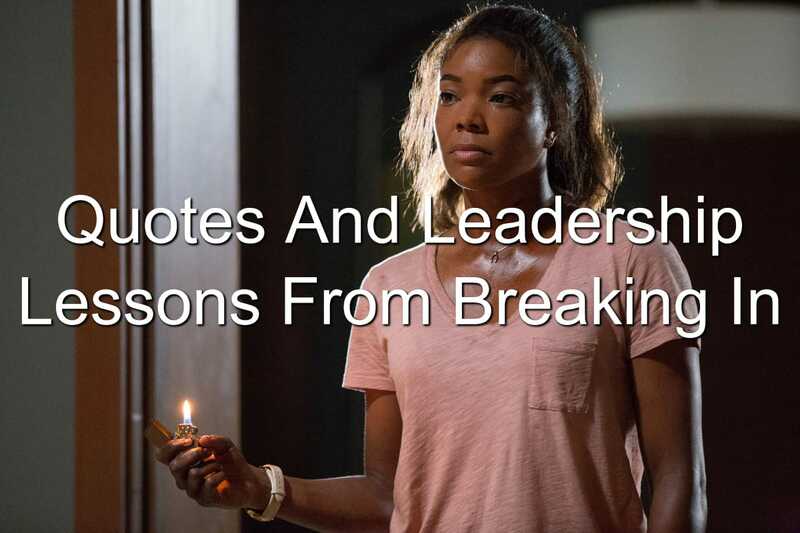 Not only do you get a tense thriller with Breaking In, you will also find plenty of leadership lessons in Breaking In. It’s not your job to worry about me. Jasmine had begun to worry about her mother. She could see a sense of sadness sweep over the woman who had raised her from birth. And she was concerned. Her mother responded to Jasmine’s inquiries and told Jasmine not to worry about her. It wasn’t Jasmine’s job to worry about her mom. It was Shaun’s responsibility to worry about her daughter. Organizations have a hierarchy. As a leader, you’re in a position of power and influence. You’re also in a position of responsibility. It’s not your team’s responsibility to worry about you. It is your responsibility to be concerned about your team. You need to be concerned whether or not they have the tools to get their job done. You need to be concerned your people are mentally there. And it’s your responsibility to be concerned with the culture within your organization. There were plenty of little details to cue the Russell family that something was wrong. As little Glover was flying his drone, it suddenly stopped. He found the drone on the kitchen floor and was quickly snatched by one of the bad guys. Shaun was walking around outside and noticed the garage door was partially open. This was one of the ways the criminals had entered the home. Had they paid attention to what was happening, a lot of the trouble they experienced could have been prevented. There are little details leaders overlook every day. It’s not due to a lack of care or not paying attention. Many times leaders overlook the details because they’re engrossed in the big picture. Their eye is on the prize. Watch out for the details. The details can clue you in on trouble brewing. Shaun was exploring the garage when she was attacked by Peter (Mark Furze). They fought and fought until Shaun was able to take a broken wine glass stem and stab Peter in the chest. While Shaun wasn’t prepared to act, she was ready to act when the time came. She saw the opportunity and seized upon it. Great leaders know they have to be ready to act when they see an opportunity. From purchasing another company to hiring great talent, they act when it is time. Are you willing to act when the time comes? The situation has changed. The goal hasn’t. Eddie (Billy Burke) was the ringleader of the criminal element that had broken into the Russell home. He was also wise. He and his band of merry criminals had planned an easy heist. There was supposed to be no one in the home. Instead, the situation changed when Shaun and her children showed up. Knowing the goal, Eddie encouraged his team to stay the course. To continue working towards the goal. The situation had changed. The goal hadn’t. 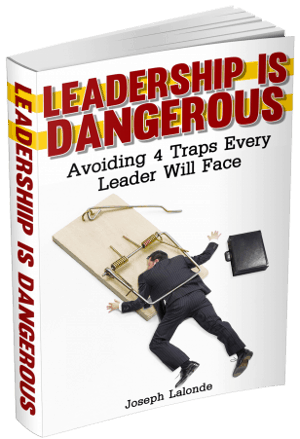 You and your leadership team will lay out the perfect plan… Only to have the situation change. Maybe it’s a team member quits or project funds dry up. This changes the situation. It doesn’t change the goal. You can continue to work towards the goal. It will just require a different approach. Eddie knew a mother’s instinct is to protect her children. He saw this as a weakness. And it could be. That’s what Eddie was anticipating. He knew Shaun wouldn’t leave for help. She would stick around for her children. Knowing your competition’s weakness can help you lay out a game plan for competing with them. Look at your competitors. What are their strengths? What are their weaknesses? See what you can use and then use it. Eddie, Duncan (Richard Cabral), Sam (Levi Meaden), and Peter (Mark Furze) had locked Jasmine and Glover into a bedroom. This terrified the duo yet they still took action to get out. Jasmine was able to find an access in the wall and crawl out. Glover wanted Jasmine to take him with her. He was worried about her. Knowing she had to act, Jasmine reassured Glover she would be okay. She would find their mother and get out them out of the house. There are times when your team will be scared. They will be fearful of a job loss or a bad business deal. In these times, it is your responsibility as a leader to reassure them. You can tell them it will be okay. You can show them the reasoning behind the business decision. By reassuring your team it will be okay, you can crush a lot of frustration and dissent. Jasmine was able to reach her mother. But something strange happened when she did. Shaun told her daughter to go back to her brother. There was protesting from Jasmine yet she relented and went back to the room. This was after Shaun encouraged her. She let Jasmine know she believed in her. Great leaders are like Shaun in this situation. Your team will have doubts on whether or not they can pull off an amazing job. This is when you need to have faith in your team. You need to also let your team know you believe in them. Tell them you have faith in their skills and abilities. Your faith in them will mean the world to them. As Shaun was creeping through the home, she stumbled upon Duncan on the upstairs balcony. She had to act quickly. She latched onto the side of a staircase. And hung on for dear life. Her action here required endurance. She had to exert extreme strength for an extended period of time. Leadership requires similar endurance. You’re going to face roadblocks and setbacks. These things will require you to hold on longer than you thought you were going to have to. Be willing to endure the trials of leadership. It will pay off in the end. Shaun made a deal to meet with Eddie. When the time came, she brought Peter with her. While holding a knife to his neck. Eddie didn’t care about Peter. He cared about the goal. So he shot Peter. And took the flash drive around his neck. Don’t be like Eddie. Don’t be so focused on the goal you destroy your people. You are better than that. You know you have to care about the people you lead. There were so many deaths in Breaking In. All of the deaths were due to the actions of Eddie. His poor leadership led to the deaths of so many people. Maggie Harris the realtor (Christa Miller), Peter, Shaun’s dad, Sam… All dead due to Eddie. You don’t have to leave a wake of destruction in your path to get things done. You can lead well by caring for those you’re leading. After all this, is this what you really want? Shaun noticed the destruction left because of Eddie’s desire for the hidden cash. She wondered if this was what he really wanted. You have to be cautious going after your dreams. When you begin seeing success, are you staying true to who you were when you began? Or have you begun to change and do the things you said you’d never do? I’ve seen people lose their spouse, their home, even their soul in pursuit of “success.” I wind up wondering if this is what they really wanted. Don’t let success ruin who you are. Duncan was one of Eddie’s men. He was also crazy. He was the one who had killed Maggie. Sam noticed how crazy Duncan was and brought it up to Eddie. Eddie dismissed Sam’s concerns. In the end, Eddie’s dismissal cost him his life. Duncan was crazy. And Duncan killed Eddie. Be careful of bringing crazy onto your team. Crazy will destroy your team from within. Take care to vet your team members before bringing them on. Interview them multiple times and using multiple people. Take time to meet their family. Do background checks. Finding crazy before they get onto your team will save you many headaches. Breaking In reminded me of a female-led Taken. Normally in a revenge thriller like this, the hero is a scorned father going for vengeance. Breaking In twists this and puts the mother in this role. And Gabrielle Union as Shaun pulled it off well. She showed the anger and determination as well as Liam Nesson does in the Taken series. If you’re a woman, don’t let that stop you from getting into leadership. You can lead just as well as a man. Question: Have you seen Breaking In? If you have, did you take away any leadership lessons from Breaking In? If you haven’t seen the movie, what leadership lessons from Breaking In that I shared resonated with you? Let me know in the comment section below.